Six BRDC Superstars continued their 2010 preparations with an intensive physical training weekend held over March 5th – 8th. In association with the Porsche Human Performance Centre, Alexander Sims, James Calado, Stuart Hall, Jason Moore, Dean Stoneman and Riki Christodoulou were all put through their paces in a series of challenging exercises. The training itself was intended to be varied, challenging, motivational and specific to motor-sport. Located at the Sandy Balls Holiday Camp deep in the heart of the New Forest, the facility offers excellent facilities for training with a first class sports complex and gym, some fine local terrain and excellent lodges to stay in. Saturday’s activities kicked off with a 1 hour strength and conditioning session starting at 7.00am. Later in the morning a 2 hour running session took place in the local woods. Following advice on correct running technique, something most of the Superstars had never had before, a Fartlek running session took place. This involves interval running sessions of both fast and medium pace around a cross country course. 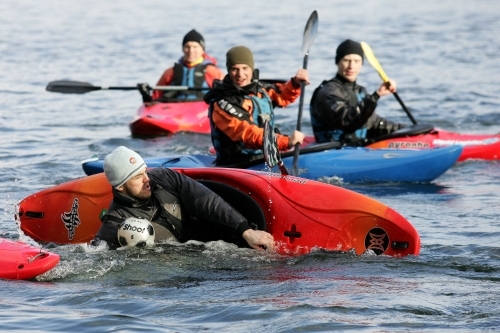 The afternoon’s training session involved a 3 hour Kayaking session on a nearby lake. Once the proper technique had been learnt, an arduous and competitive session took place. Nevertheless a couple of inevitable ‘driver errors’ resulted in a dunking in the very cold water! A late afternoon sports massage followed by a group evening meal was welcomed by all. Sunday’s activities included a 7.00am swimming session, road and mountain biking, more strength and conditioning exercises, another sports massage and an evening presentation covering pre, during and post race preparations. For those who were still up for it, a morning run took place on Monday and further 1.5 hour strength and conditioning session, before a tired but happy group of Superstars disbanded at lunchtime.